The shortening velocity affects the amount of force generated by a muscle. Twitch contractions, which are short in duration, do not reach peak force. Tetanic contractions, which are long in duration, reach peak force and plateau. The shortening velocity is the speed at which a muscle changes length during a contraction. The force of a muscle contraction declines with increasing velocity. Force-Velocity Relationship: The relationship between the speed and force of muscle contraction, outputted as power. summation. : The occurrence of another twitch contraction before complete relaxation of the prior twitch has occurred. tetanic: A longer contraction of a muscle which reaches peak force. twitch: A short contraction of a muscle which does not reach peak force. Skeletal muscle contractions can be broadly separated into twitch and tetanic contractions. In a twitch contraction, a short burst of stimulation causes the muscle to contract, but the duration is so brief that the muscle begins relaxing before reaching peak force. If another contraction occurs before complete relaxation of a muscle twitch, then the next twitch will simply sum onto the previous twitch, a phenomenon called summation. If the stimulation is long enough, the muscle reaches peak force and plateaus at this level, resulting in a tetanic contraction. Force-Velocity Relationship: As velocity increases force and power produced is reduced. Although force increases due to stretching with no velocity, zero power is produced. Maximum power is generated at one-third of maximum shortening velocity. 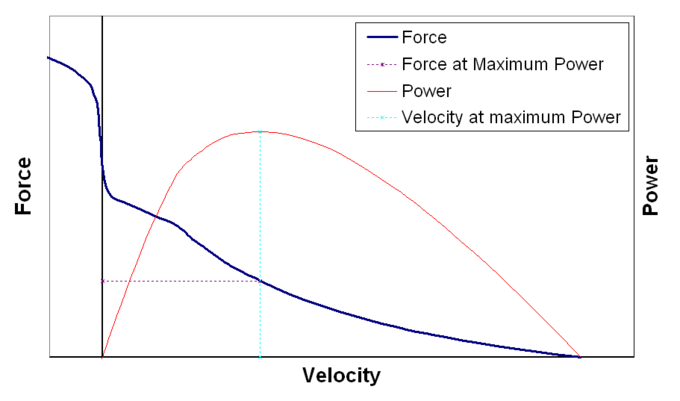 The force-velocity relationship in muscle relates the speed at which a muscle changes length to the force of this contraction and the resultant power output (force x velocity = power). The force generated by a muscle depends on the number of actin and myosin cross-bridges formed; a larger number of cross-bridges results in a larger amount of force. However, cross-bridge formation is not immediate and if myofilaments slide over each other at a faster rate, their ability to form cross-bridges and subsequent force are both reduced. At a maximum velocity no cross-bridges can form so no force is generated, resulting in the production of zero power (right edge of graph). The reverse is true for stretching of muscle; although the force of the muscle is increased, there is no velocity of contraction and zero power is generated (left edge of graph). Maximum power is generated at approximately one-third of maximum shortening velocity. Twitch contractions are short in duration. Though they have high velocity, they begin resting before reaching peak force. Tetanic contractions, which are long in duration, reach peak force and plateau.